Tomato season is in full swing! Garden vines hang heavy with clusters of fruit ripening under the hot July sun. My own planter boxes are straining at the seams with the impending harvest at hand. I planted a record number of heirloom varieties this year–all started from seeds I saved during last summer’s gleaning. 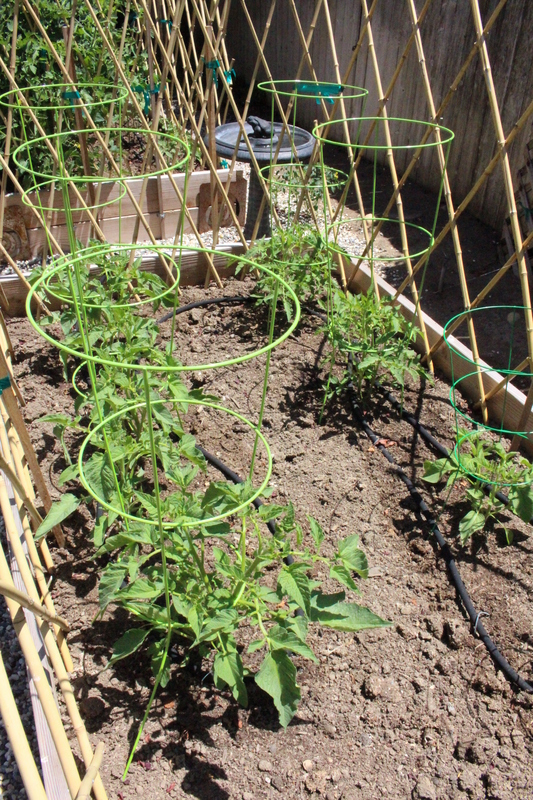 In early May, I tucked the eight-inch tall seedlings into prepared planter boxes in our backyard and crossed my fingers. There were 28 in all. Twenty-eight! In prior years our family of four had barely been able to keep up with the harvest from three plants. Finger crossing aside, it wasn’t long before my tiny starts took on a life of their own. First they outgrew their stakes. In six weeks time they overflowed the planter boxes! With a bumper crop on the way, I will soon be busy making sauce, chutney, and jam to preserve the rich taste of our tomato harvest for the lean winter months ahead. 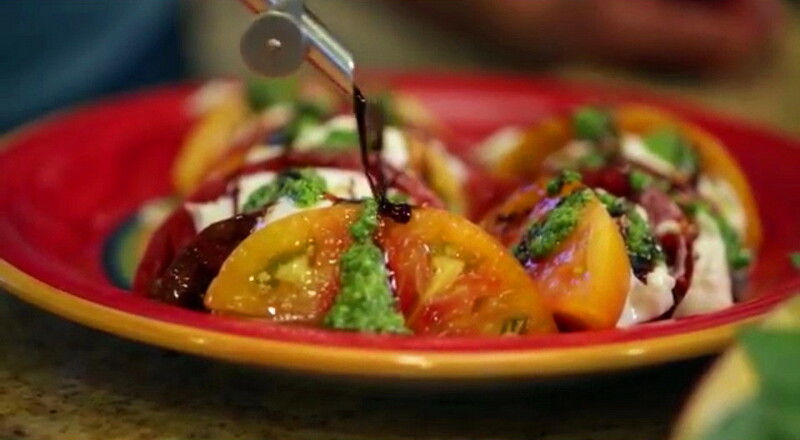 Few dishes showcase summer heirloom tomatoes better than a simple Caprese Salad. This Italian favorite pairs ripe, juicy slices of tomato with creamy Buffalo-style mozzarella cheese and homemade fresh basil pesto for a perfect light lunch or dinner entrée. Finish with a drizzle of best quality Balsamic vinegar and enjoy! 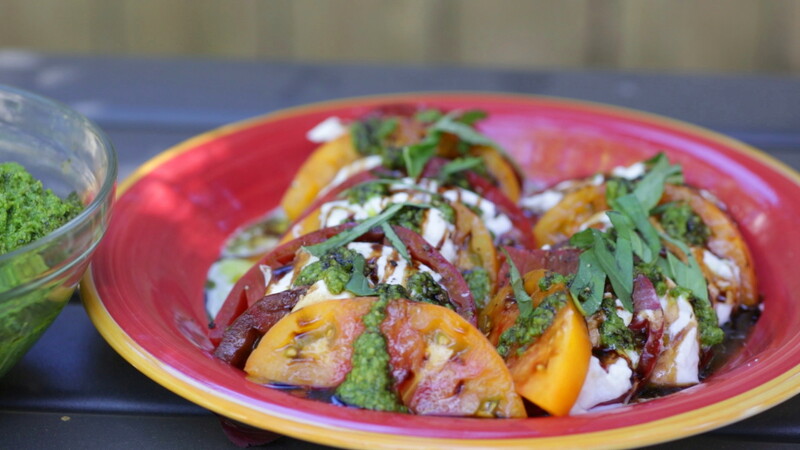 *You can watch me make this delicious Caprese Salad in less than three minutes on the second episode of Cooking Guru, Season 2, below! Thanks for tuning in and please share with all your friends on social media (recipe follows). *This salad is all about the quality of the ingredients used. 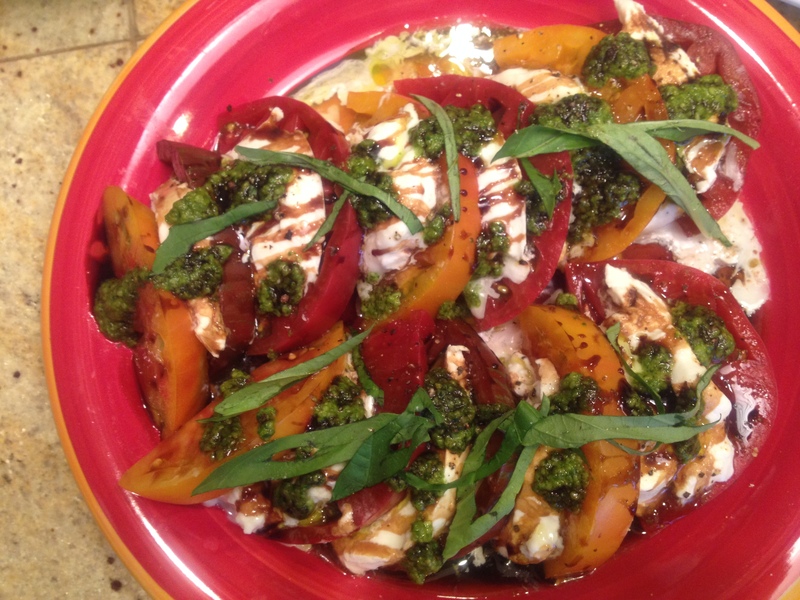 Summer tomatoes and creamy Buffalo mozzarella are the only way to go! A selection of ripe heirloom tomatoes (red & yellow preferred). 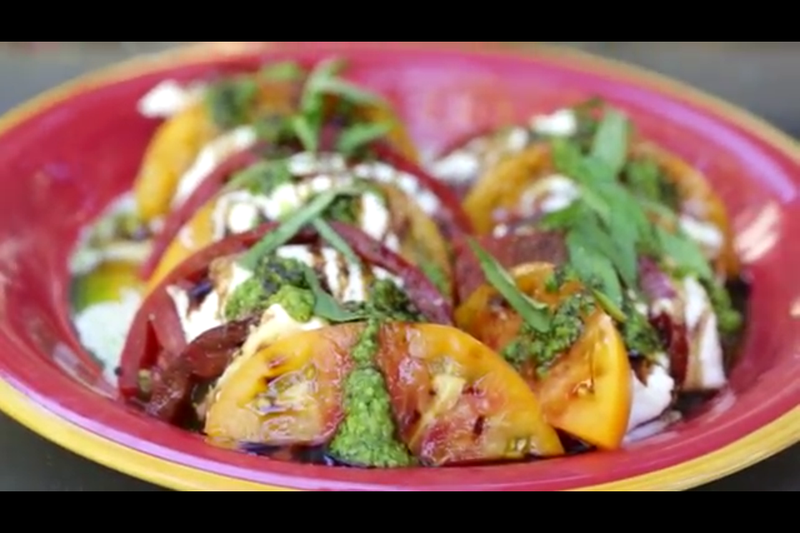 *Allow ½ medium red and ½ medium yellow heirloom tomato per serving. fresh Buffalo mozzarella cheese; water packed. Cut tomatoes and mozzarella ball into thick slices. Overlap tomatoes on a large platter or individual salad plates (alternating colors if using red & yellow varieties), with a thin slice of mozzarella between slices. 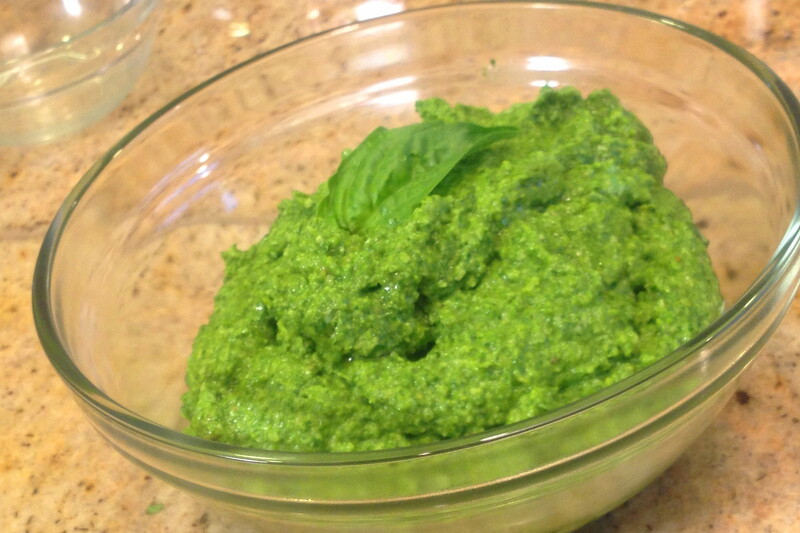 In a small bowl, combine 2 teaspoons of pesto with 1 tablespoon best quality olive oil until blended. Spoon over tomato/mozzarella slices. Drizzle with best quality dark balsamic vinegar. Sprinkle with fresh basil chiffonade. 5. Finish with a grind of sea salt and fresh pepper. 1. Gently rinse basil with water and pat dry or dry in a salad spinner. Separate the leaves, discarding the stems. 2. Pack the leaves in the bowl of a food processor with grated cheese, garlic, lemon juice and pine nuts. Pulse until finely chopped. 3. With processor running, slowly drizzle in olive oil–pausing while it incorporates–until a smooth paste forms. Note: You may refrigerate some of the pesto in an air tight container for use within three days. *You can freeze extra pesto in ice cube trays, then pop the individual cubes into a freezer tight zip lock bag for fresh pesto on the fly! *Pesto will naturally darken when exposed to air. This does not affect flavor. Adding lemon juice will help reduce this tendency. Beautiful and inspiring Karen. I must admit, when it is tomato time I have to stretch myself to cook anything else! Tomatoes, Cheese and crusty bread are all I really need. Cheers! Thanks Heidi. That simple trio is indeed a winner as well! My absolute favorite salad. 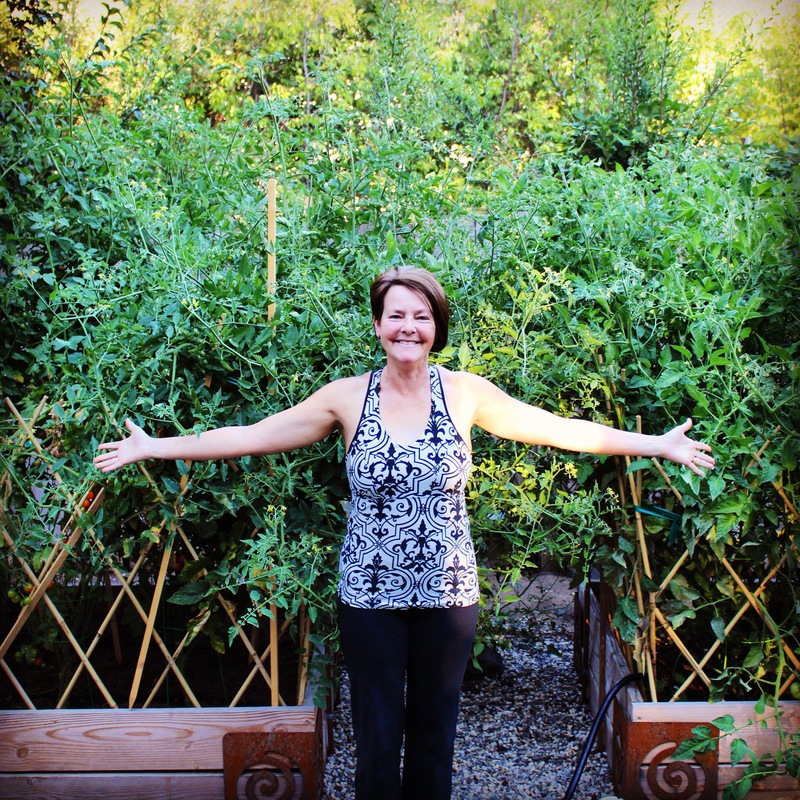 Your photos are terrific and it is great to see how your plants are progressed.